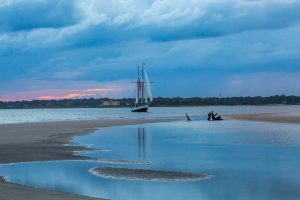 As millions of tourists travel through historic St. Augustine year after year, they often utilize the historic St. Augustine bayfront as the perfect backdrop to capture the memory of their vacation. With its iconic lions at the foot of the bridge and the sailboats along the water, it’s a breathtaking view and one worth capturing. Now, locals and tourists can experience the bayfront from a different perspective. A sunset sail aboard the Schooner Freedom, docked at St. Augustine’s Municipal Marina in the heart of the Historic District, is one of 97Park’s, an award-winning real estate brokerage in St. Augustine, favorite things to do in America’s Oldest City. Sailing the waters of St. Augustine is the perfect way to wind down after a day of sightseeing. People young and old enjoy a sail aboard the Freedom (the captain is especially accommodating of requests by children to take a turn at the wheel), and the waterfront vistas are stunning. 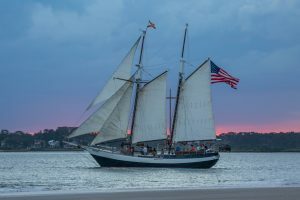 Even better, the captain and crew are locals and super friendly, so vacationers can get insider tips on what to do in St. Augustine, where to eat, and how to get around. If you are looking to take the plunge and move to the St. Augustine area, they might even point you in 97Park’s direction to help you buy your dream home. With her sails unfurled, the Schooner Freedom, listed as one of the top ten attractions in St. Augustine by USA Today, is a beautiful sight. She’s 76 feet with nearly 2400 square feet of sail, and has a capacity of only 41 passengers per her license, so you’ll receive personalized attention by her crew. Passengers on the Freedom are always happy and relaxed- and why not with the beverages and snacks, music and views aboard! If you’re lucky, you may even spot a dolphin or a pod of them! Ready to sail off into the sunset (literally) onboard the Schooner Freedom? The Freedom’s sunset sails are understandably quite popular, so we recommend booking your reservation well in advance. We predict you’ll become a fan of the Schooner Freedom just like the team at 97Park Real Estate is. Ready, set, sail!